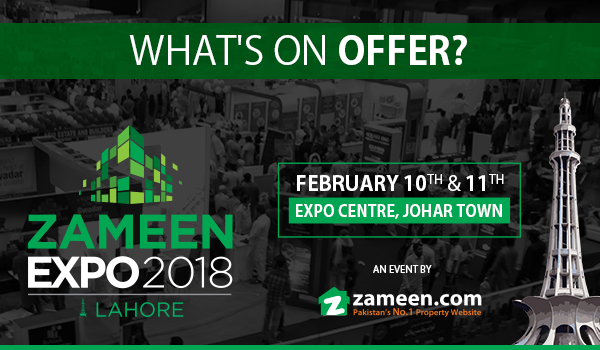 Zameen Expo 2018 – Lahore is just 10 days away! Lahore: The much awaited Zameen Expo 2018 Lahore is just 10 days away from being held in the City of Gardens once again. It is scheduled to take place on the 10th and 11th of February at the Expo Centre in Johar Town from 10 am to 8 pm. The expo will host more than 120 exhibitors from all over the country, exhibiting their projects and offering free consultations to the visitors. These exhibitors include famous names from the property sector including Izhar Mannoo Developers, Shaikhani Group, Pak Asia Group, Munawar Estate and Builders, Bodla Builders Realtors & Developers, and MNS Builders. The visitors can also learn a great deal about some of the most attractive projects from Lahore, Karachi, Islamabad, Rawalpindi, Multan, Bahawalpur, Gujranwala, and Gwadar. The more prominent of these projects include Eighteen, Naval Anchorage, The Springs Apartment Homes, Palm Villas, Gwadar Central, Madina Mall & Residency, Master City, Paragon City, Etihad Town, Motor City, Lahore Fortress Apartment Homes, Gold Crest, Canal Residencia, River Walk, Palm City, SA Garden, Angel Homes, Imperial Mall and Sun City. For more information on Zameen Expo 2018, Lahore, stay tuned to Zameen News.